Set in the future, 16-year-old Katniss Everdeen is living with her mother and little sister Prim in what's left of North America, in one of 12 districts all being run by the Capitol. Despite mastering the skill of hunting with a bow and arrow, Katniss still struggles to keep her family from going hungry. Each year, the names of all residents between the ages of 12 and 18 are entered into a lottery and two names, one girl and one boy, are chosen at random from each district to compete in the televised Hunger Games. The 24 children must try to kill each other off and the last one standing is rewarded by the Capitol with a feast of food. When Prim's name is selected, Katniss steps up to take her place in the deadly competition. 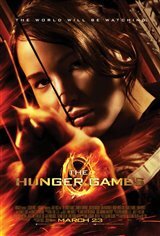 Based on the first novel of Suzanne Collins' bestselling "The Hunger Games" trilogy.